ISLAMABAD: Minister for National Health Services, Regulations and Coordination (MoNHSRC), Saira Afzal Tarar, said on Friday that the government was committed to achieving universal health coverage through efficient, equitable, accessible and affordable health services. 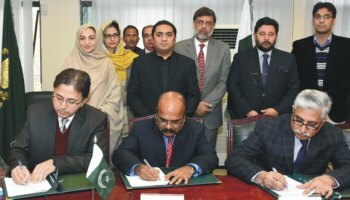 She was talking at the signing ceremony of a contract agreement between MoNHSRC and National Engineering Services Pakistan (NESPAK). She said that this is only the start of a small but strategically very significant milestone that is to build a central warehouse at national level which will meet not only the requirement of three priority communicable diseases but could also serve the purpose of warehousing and logistical support to other health programmes. She said this warehouse will provide a state-of-the-art warehousing and logistic support not only for acquired immune deficiency syndrome (AIDS), Tuberculosis (TB) and Malaria programmes but also become a role model for the other provinces for the best warehousing and logistics. She said that another objective that would be achieved through this initiative is to integrate the supply chain management functions of the three national programmes. She said the availability of essential medicines and supplies especially to the poorest is an important indicator for the ‘Universal Health Coverage Index’ and this step will be an effort to ensure better performance of Pakistan in this area. She congratulated NESPAK for winning the contract for engineering consultancy services for this warehouse. Also, she hoped that NESPAK will deliver results in the shortest possible time while ensuring no compromise on the quality.